TYPE. Pachena Beach, Bamfield, Vancouver Island, British Columbia, Canada; mid intertidal pool on rock, 5 June 2007; UNB GWS008273. 12 Dec 2017. G.W. Saunders. © G.W. Saunders. Published in: Maggs, C.A., Le Gall, L., Mineur, F., Provan, J. & Saunders, G.W. (2013). Fredericqia deveauniensis, gen. et sp. nov. (Phyllophoraceae, Rhodophyta), a new cryptogenic species. Cryptogamie Algologie 34: 273-296. 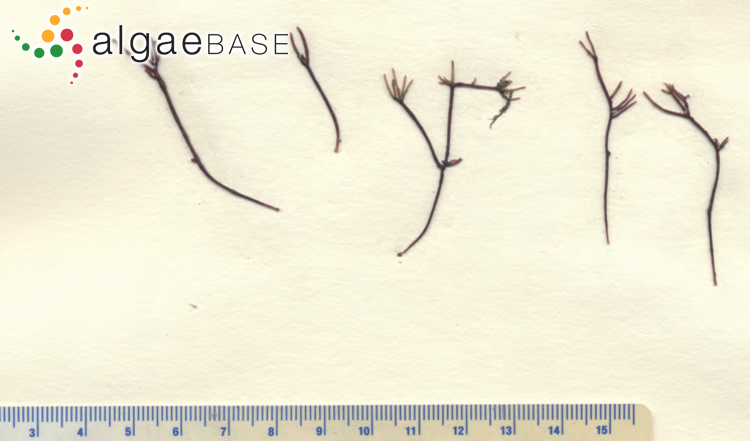 The type species (holotype) of the genus Fredericqia is Fredericqia deveauniensis Maggs, L.Le Gall, Mineur, Provan & G.W.Saunders. Gametophytes forming clumps of terete wiry fronds 100-300 mm tall, axes to 1.5 mm in diameter, 10-15 times dichotomously branched, red to purplishblack in colour; cystocarps borne on main axes or lateral proliferations; males apparently unknown; sporophytes crustose, cohesive, known only in culture, tetrasporangia not yet observed. Holotype locality: "Pachena Beach, Bamfield, Vancouver Island, British Columbia, Canada (48.7862° N; 125.1191° W)" (Maggs et al. 2013: 288). Holotype: D. McDevit, B. Clarkston, K. Roy and H. Kucera. ; 5 June 2007; mid intertidal pool on rock, . UNB GWS008273 (Maggs et al. 2013: 288). North America: California (CA) (Silva 1979). North America: Baja California N (Pacific) (Maggs et al. 2013), British Columbia (Maggs et al. 2013), California (CA) (Maggs et al. 2013). Accesses: This record has been accessed by users 177 times since it was created. Paul Gabrielson in Guiry, M.D. & Guiry, G.M. 2019. AlgaeBase. World-wide electronic publication, National University of Ireland, Galway. 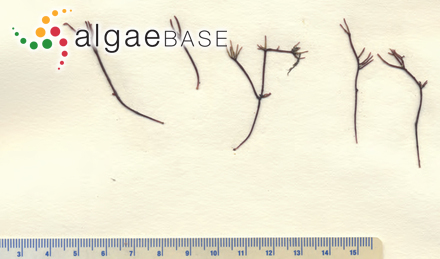 http://www.algaebase.org; searched on 18 April 2019.